Games and software development firm Epic has announced the rollout of a new retail platform. The headline feature on this new venture is the competitive revenue share terms; developers will be keeping a whopping 88 per cent of cash made from games, compared to just 12 per cent going to Epic. The store is set to launch 'soon' with a curated selection of games, and will be opening up to other projects and platforms throughout next year. 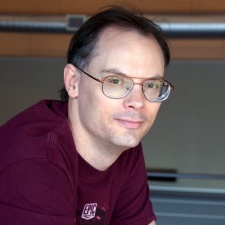 "As a developer ourselves, we have always wanted a platform with great economics that connects us directly with our players," said Epic Games founder and CEO Tim Sweeney (pictured). "Thanks to the success of Fortnite, we now have this and are ready to share it with other developers." This comes as Valve announced changes to its own revenue share terms. Developers pay 30 per cent of money made on Steam, a figure that drops to 25 per cent once a project makes more than $10m and dips even further to 20 per cent when they get over $50m. This has been met with a fairly negative reception from the development community, particularly indie studios. Yesterday, PCGamesInsider.biz wrote that Steam's time was up as the platform works for fewer and fewer developers alongside myriad emerging platforms such as Discord, Kongregate's Kartridge and now Epic. Fortnite, the project that seems to have made this possible for Epic, now has 200m players. As part of our PC Revolution initiative, you can keep up to date with the trends, tech and news that is going to affect the PC games market in the coming years via PCGamesInsider.biz and our upcoming event, PC Connects London 2019, which is taking place on January 21st and 22nd. At the show we'll be talking about the state of the market, how to get your game noticed, going behind the scenes on the biggest releases and the newest tech how to run a games-as-a-service project, as well as the trends and tech that are going to inform the next decade of the PC games sector. Mid Term ttickets are available now with a 20 per cent discount and can be bought here. These grant access to not only PC Connects London 2019, but our sibling events Pocket Gamer Connects London and Blockchain Gamer Connects London. Buy now to save big! We're still on the hunt for speakers so drop me a line at [email protected] if you want to be involved with the show, or if you want to add your voice to the PC Revolution here on PCGamesInsider.biz. There are also sponsorship opportunities available for the show. To find out more, please email [email protected]dia.co.uk. Complementary events or media outlets interested in a media partnership are welcome to contact [email protected].